There is a significant risk of losing your entire investment if the case fails. No FSCS coverage. There is a significant risk of losing your entire investment if the case fails, and you could in rare circumstances lose up to double.. No FSCS coverage. 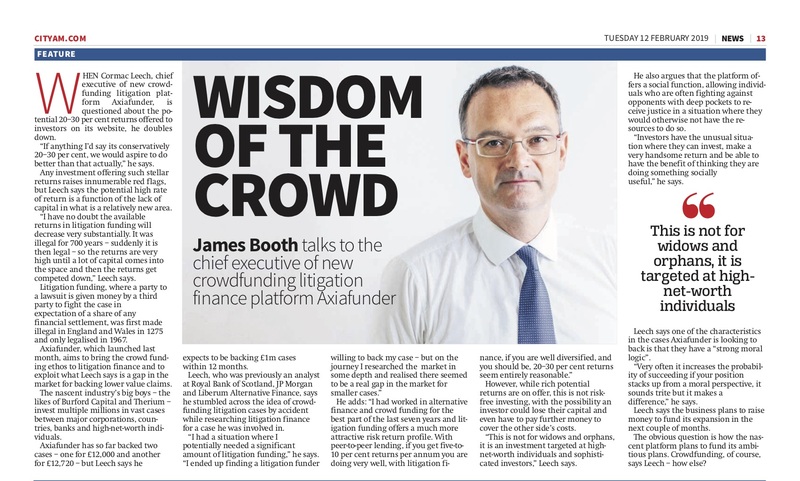 Litigation Crowdfunding: Socially Inclusive or Ambulance Chasing? What are the risks facing an investor in litigation funding? The Best Kept Secret in Investing? You can unsubscribe at any time by activating the link in our emails. Investing in offers promoted by AxiaFunder involves risks. Capital is at risk and projected returns are not guaranteed. Investors have a significant risk of losing all of their investment if the case fails. Investments promoted by AxiaFunder are not listed or traded on any recognised exchange. This means you will not be able to easily sell your investment if you need to get your money back quickly. Investments are not covered by the Financial Services Compensation Scheme (FSCS). AxiaFunder is a trading name of Champerty Limited (FRN 811606), an appointed representative of Share In Ltd, which is authorised and regulated by the Financial Conduct Authority (FRN 603332). Investments offered on this website are not offers to the public. Investment can only be made by registered investors on the basis of information provided by AxiaFunder. Share In Ltd takes no responsibility for information provided by AxiaFunder. © 2019 AxiaFunder. All Rights Reserved.